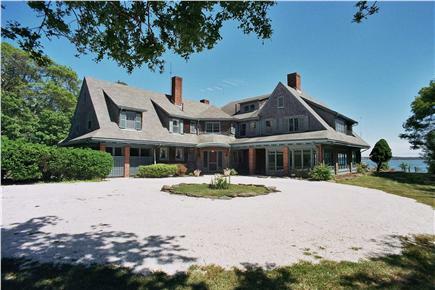 Enjoy breathtaking water views from Manor-by-the-Sea, a handsome estate located on its on 200 feet of sandy beach. 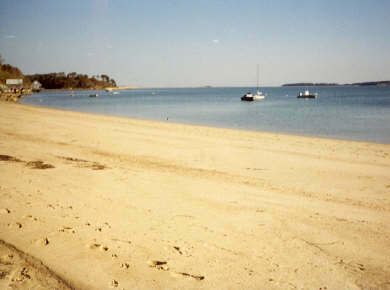 Picturesque Big Pleasant Bay is one of the Cape’s best locations. With ten bedrooms and six full baths, the home is ideal for a family reunion or several families vacationing together. The home features a large living room with fireplace, a formal dining room with fireplace, and a 40-foot game room with pool table and ping pong. The wrought iron table and chairs and the grill on the portico enable outdoor dining while overlooking the water. The enormous lawn is ideal for fun or relaxation. Amenities include washer/dryer, dishwasher, cable TV, and VCR. We will happily send you a picture brochure. So, we stayed here with fourteen people (ages from 11 to 73) and could not have asked for a better Cape Cod experience! The house is beyond amazing! Ten bedrooms, 6 bathrooms. One of the "full" baths is actually split between a 1/2 bath and a shower room. A shower room! You will love it! There is more than enough room to be together or apart and you will never have a better game of hide-and-seek! The bay is shallow and full of interesting creatures to see. Perfect for leisure swimming, kayaking and probably some type of fishing. Nauset and Skaket are a ten minute drive tops. Kitchen and pantry area have any cooking utensils you could need. There is so much storage that finding the pie pan, cheese grater, egg slicer is an adventure in itself. 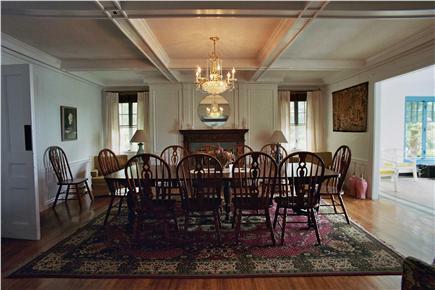 There are four bedrooms in the "servants" area, all a good size that share one bathroom. The bathroom is very large. Then in the main sleeping area up that gorgeous staircase in the pictures are the other six with two en suites and four bedrooms to share (2) LARGE bathrooms and the shower room. I cannot say enough wonderful things about this house. If you want old charm Cape Cod, you should stay here. Fair warning: We stayed the first full week of August 2018. A local told us it was the hottest it had been in three decades. It was mid to high eighties all week. Yes, it was hot. The house does not have A/C. BUT, there are fans everywhere and we brought some too. I am not going to tell you that we didn't have moments where we wished it was cooler. But, the water is literally a stone's throw! There are beach chairs on premise. Grab one, put it in the water! The back yard is large enough to fly kites. Kites! In the back yard! The property itself is secluded but not so far off the beaten path to be annoying. No, you can't ride bikes at the house (well I guess you could ride them in the grass...) but, the official Cape bike path is close enough to get to....get them back on the car/truck and head over to any number of entry points. It is a magnificent property that was built in 1915 and we hope you have a change to enjoy it like we did. While we were there we spoke to Brad a few times to get some small pieces of info. He was always attentive and quick to respond. 50 Cheers for 50 Years was the theme of our of our 50th anniversary celebrated at this wonderful home in South Orleans. Situated right on Pleasant Bay, it proved to be everything it claimed to be and provided our extended families with an unforgettable experience. Yes, it was the sleeping capacity that caught our attention, but what we found when we got there was far more than we could have imagined. Old Cape feel, best house in 26 years! This was easily the most beautiful house we have ever stayed in. We came with a group of 17 people and the only problem was there was too much space! When we pulled up, our jaws were already on the floor. 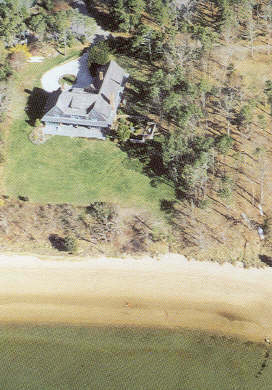 My personal favorite part of the house was the backyard and its magnificent view of Pleasant Bay. It literally takes 30 seconds to get from the back of the house to a nice swimming bay. The rooms, kitchen, living room, gaming room are all beautifully decorated and have that old Cape Cod feel. I don't know anyone who goes to Cape Cod for the modern vibe, but if you're worried about the amenities and luxury of a newer home, fear not. Our group was extremely comfortable and happy with the rooms and property, and most of our group are seasoned travelers from New York City. The house is perfect for family reunions, large groups, and even single families if they are looking for the proper Cape Cod kind of vacation in a more spacious home. Brad the owner was extremely welcoming and accommodating. He answered all of our questions and had the house in tip top shape on our arrival. Great Cape Getaway for large group! We had a wonderful time at the Manor - it's huge with more than enough room for 4 plus families with children - quiet, calm beach was great for the little ones. We had so much fun this summer - we've booked the same week for next summer! This was a great house for five different families with 9 children ranging from 9 mos - 4 years old. There was ample room and the bedrooms in the main wing of the house are HUGE!!! We spent a lovely week and couldn't have been happier with the location.